Even successful e-commerce businesses hate them, but returns are a part of e-commerce. For some e-commerce setups, managing reverse logistics is more complex than managing the sourcing of goods and having them delivered by using a third-party logistics provider. Even if that's the case, you cannot avoid having a clear and fair returns policy. Managing returns is not new. Physical retailers have dealt with returns since forever. That is not to say that all retailers follow the same returns policy. Some retailers are known for a very friendly returns policy, almost to the point of "no questions asked," while others make it very tough for you to return goods. The online world too has a similar variety of returns policies. If you are creating a policy to deal with returns or re-evaluating your existing returns policy, here are some important issues to keep in mind. Can All Types of Goods Be Returned? Customers grow uncomfortable as you include more items in your non-returnable list. But if your list of exceptions seems reasonable, there should be no problem. For instance, you could refuse to accept returns of undergarments that have been worn even once. In addition, you might have reason to reject other goods if they are hazardous, and hence cannot be accepted after they have been handled by the customer. Is There a Deadline After Which Returns Will Not Be Accepted? Return periods commonly range from 14 days to 90 days. A 30-day period for returns is quite common. At the deadline, you sometimes have to split hair. For instance, do you consider the date of shipping by the customer as the date of return, or the date when it was received back by you? It is best to spell out such details in your returns policy to avoid conflict later. Returns after 14 days, up to 30 days can get a 75% cash refund or 100% store credit. Returns after 45 days are not eligible for a refund. And if that is not complex enough for you, you could also consider having a different return deadline depending upon the category of goods being returned. If the rationale behind a differential deadline is reasonable, customers are likely to accept it. Once again this is a decision that you need to make based on your experience with your customers and product category. Competitor behavior can be a factor in making this decision. Customers prefer cash, businesses prefer store credit. Make sure to weigh the pros and cons before finalizing your policy. What Is the Process of Returning the Goods? It can be frustrating for a customer to return a product but have the refund claim rejected solely because the receipt was not included. If possible, consider accepting returns without a receipt, especially if the customer is able to present you with all the details of the transaction. If a receipt is absolutely required, then make sure that this is clearly mentioned in your returns policy. An interesting case in point is the "No receipt returns policy" of Walmart.com. 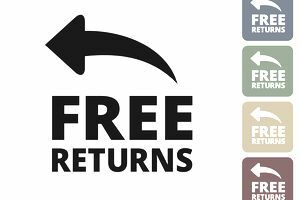 As long as you do not return without a receipt more often than 3 times in a 45-day period, and the value of your returns in each case is under $25, you are eligible for a full cash refund. (Note: This policy was in place at the time of writing this article. To get the latest policy, please visit Walmart.com). Returns do not necessarily need to be refunded. It makes sense for the e-commerce business to attempt to fulfill their earlier inadequacy. For instance, if a customer returns a music player because its display does not work, then the e-commerce player should attempt to replace the music system with another piece. Most customers would find it reasonable if you considered the option of a refund only in the case where you are unable to offer a replacement. The preceding discussion has to be ignored to the extent that regulations in specific territories require. There are laws that can influence the restrictions you can place on returns. Make sure that you seek competent advice to find out the laws that govern returns in your territory. In addition, we have seen, as in the case of e-commerce taxation in the state of Texas, laws change; so keep track of relevant legislation.